For those who don’t know, Kuwait Airways flew New York/JFK to London/Heathrow for years. It hearkens back to the days when airlines couldn’t fly nonstop between their home countries and far away lands, so they had to stop somewhere. Of course, that’s no longer an issue for Kuwaitis looking to fly to New York, but the flight soldiered on… until now. You might just assume this was a commercial decision, and that would be sensible. But it’s not. Kuwait refuses to fly anyone with an Israeli passport. That’s fine for people going to Kuwait because people with an Israeli passport aren’t allowed into the country. But Israelis can absolutely fly from New York to London, of course. Someone challenged the policy, and the US agreed, requiring Kuwait to carry Israelis on that flight. Instead of bowing to that pressure, Kuwait opted to just pull the route entirely. You may have heard about this, but now you can read the whole thing for yourself. The European Commission has put out a 108 page document detailing the strategy for aviation in Europe in the future. Maybe “detailing” is a strong word. This document doesn’t really have much concrete in it, from what I can tell. But it’s possible I just fell asleep while reading the meaty stuff. This is not a light read. Jet Airways has announced it’s closing its Brussels operation, which connected India with both Toronto and Newark. Instead, it will move to Amsterdam. It’ll still fly to Toronto but it won’t do Newark anymore. It has new partners Delta and KLM to do that and provide a bunch more feed. Commercially this makes a great deal of sense for both. Though Etihad owns a big chunk of Jet, so isn’t Delta hypocritical for partnering? That, and more, is addressed at this link. But, but Kuwait is a major ally of the United States. Are you telling me I lived in Kuwait for nine months wearing a silly uniform protecting bigots? The US Army would never do that to me since it is a force of good. The Kuwaite government is no doubt very thankful for your service. The US government loves protecting bigoted Middle Eastern countries that violated their citizens human rights as long as they buy American made armaments which keeps people employed in the US. The Military Industrial Complex generates a lot of jobs. The government also subsidizes Israel with more money than it gives to the entire continent of Africa. Thanks for your service and have a safe holiday season. Forgot to add: Kuwait and other Airlines like Saudi should NOT be allowed to discriminate against Israeli passport holders in this manner. Requiring a transit visa to enter their countries is ok since we do it in the US (as do the Brits). Of course I find out about Kuwait Air after they quit flying the route. What other random 5th freedom flights are available between the US and Europe where I might find cheap fares and are not listed on the usual ota? Jeremy – There aren’t many left like this anymore over the Atlantic. The first one that comes to mind is the JFK Milan route on Emirates. What about all those Jet Airways flights to Brussels (soon Amsterdam) you talk about in item #3? Nice how Delta’s FAQ asks if it is hypocritical and then doesn’t actually answer that question. I sense a future polician writing that FAQ. I don’t find it anymore hypocritical than manufacturing tie ups between automobile manufacturers for jointly produced models, or in the engine world, joint productions to create the CFM. Corporations can certainly recognize expedient benefits to a joint venture with an opposing company, and yet still viciously fight them across the board in all other areas. GM and Nissan having a plant together didn’t stop them from trying to outcompete the other. Is GM running a public campaign to ask the US Government to look into state subsidies for Nissan? Most american manufacturers complained about Japanese imports for years, especially about the huge and very active subsidy program that the Japanese government ran. So yes. They must be doing it more covertly then. Doesn’t make Delta’s move less hypocritical. And they seem to recognize that people will notice that, hence the question and non-answer in the FAQ. The loss of Kuwait Airways service from USA is not exactly a loss. I rank Kuwait Airways just slightly better than Air Zimbabwe as the world wost airline (and yes, I have flown on both). Also keep in mind that Kuwait Airways is ‘dry’ and they mean dry, if you bring alcohol on board, it will be confiscated. That obviously limits the appeal to many passengers. The reality is the only people who fly Kuwait Airways are those who don’t have a choice. If you work for a company in Kuwait that has a Government contract, any flying you do has to be on Kuwait Airways or a partner they have chosen. That makes most of KU’s passengers ‘captives’. I did run into some people who flew Kuwait Airways from London to New York. They usually had the lowest fares. Most of them decided the experience didn’t make up for the low fare, and never did flew Kuwait Airways again! Not long after the first Gulf war I was in Kuwait, Kuwait Airways had lost my luggage coming from BOM, and I was being thrown out of the Hotel I was staying in because they needed the rooms for some sort of military conference. I called EK to look for a seat from KWI to DXB, and not surprisingly, they had no availability in any class. I then called GF, and they had no availability in any class. As a last resort I called Kuwait Airways. They had availability in all 3 classes. I had to fly KU again. KU eventually found the my luggage and sent it to DXB. The only good thing about having Kuwait Airways lose your luggage as an F passengers, is right off the bat, the rep opens the cash drawer and hands you 70KD (about $220) and says, ‘That’s for temporary expenses’. But are they worse than Air Koryo? It’s a distinction without much of difference, but Kuwait Airways says that it must do this to stay in compliance with Kuwait law, which forbids it from doing business with Israel or Israelis. The lack of difference comes from the fact that Kuwait Airways is 100% owned by the Kuwaiti govt. But, in theory, Kuwait Airways is essentially stuck between Kuwaiti and American law, and this the only logical outcome assuming neither of those laws changes. But practically-speaking, it’s more like the way that Cranky portrays it. 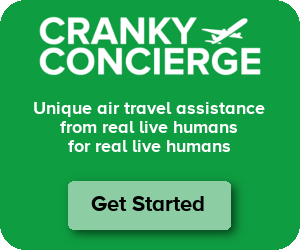 The Kuwait Airways has a lot more subtleties to it than Cranky’s short blurb implies. Kuwaiti companies are legally banned from conducting business with Israeli entities, so complying with the US law means violating the Kuwaiti law, a catch-22. Their workaround for years has been to require the passenger to provide their passport details when booking. Since Kuwait does not recognize Israel as a real country, an Israeli passport was not considered a valid travel document, so you couldn’t use it to make a booking (although Israelis with dual citizenship could use their other passport without issue). In this particular case, the passenger was an Israeli citizen living in New York on a green card. The ticket was booked through Kayak but sold by Priceline under a Jet Airways codeshare number, which is why the passport check didn’t trigger (Jet apparently doesn’t pass the passenger details to Kuwait until the day before departure). The passenger claims she didn’t even know it was a Kuwait Airways flight until she arrived at JFK. To their credit, Kuwait has a protocol to deal with cases like this which slip through the cracks, which is to rebook the passenger on another carrier at the airline’s expense. In fact, there are rumours of people with Israeli passports purposely booking premium seats on the JFK-LHR route for the cheap fares knowing they’ll get rebooked on another (better/more expensive) carrier for free. In this case, Kuwait rebooked the passenger on a BA flight to LHR the same evening. From what I’ve read, this lady isn’t really the activist type, but presumably some human rights lawyer type convinced her to file an official complaint to (literally) make a federal case out of this. A lot of people aren’t the activist type until they’ve been wronged in some way. Although I do agree that Kuwaiti airlines was stuck in a Catch-22, there didn’t seem to be any way out of it except dropping the flight. As an interesting follow-up to the Jet Airways move, Brussels Airlines announced today that they’re starting 5 x weekly service to Toronto in April specifically to fill the void on BRU-YYZ. Makes sense since both cities are Star Alliance hubs and AC/SN are in a trans-Atlantic joint venture already. What happens to the unused 5th freedom right? Does it simply disappear, or can Kuwaiti airlines just pick it up at another time in the future if they’d like? Nick – This might be a bit different since I think it was grandfathered long ago from a different era, but I just don’t know for sure about this specific case. In general though, fifth freedom rights are between countries and not airlines, so they don’t disappear if they aren’t used. Slots are a different issue. Kuwait would likely have to use its slots for other flights or I would think risk losing them.